It is so hard to believe that summer is already winding down isn’t it! As a teacher, I, and my kids go back to school in exactly two weeks. I know that many schools across the country start even sooner than that. How about you? Do your kids go back soon? Well I am still savoring as much of the summer as I can. I am also already looking back at some of the fun things we did this summer with fond memories. One of my favorite things we did was our family trip to Disney World back in June. 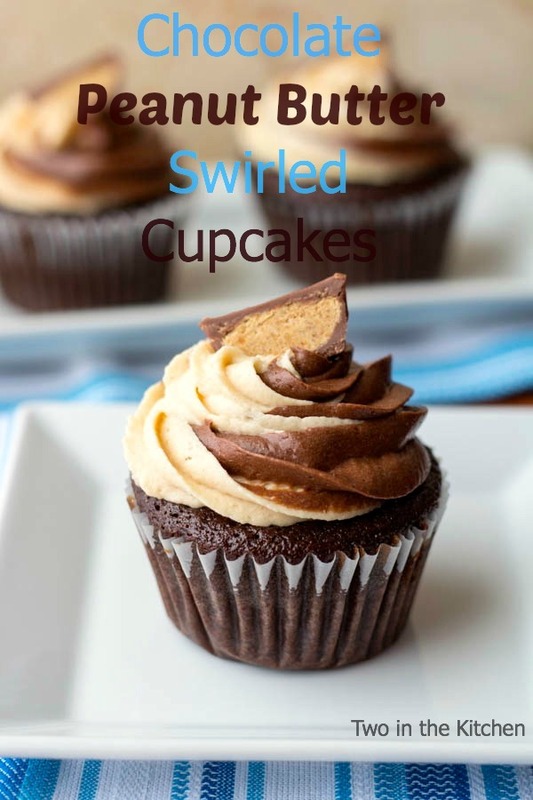 I shared this post where I highlighted several of the yummy cupcakes that we ate in the “World”. One of the yummiest was this pretty strawberry cupcake that I got from the Board Walk Bakery. In fact, it was so yummy and pretty that I decided I wanted to make a copycat version. 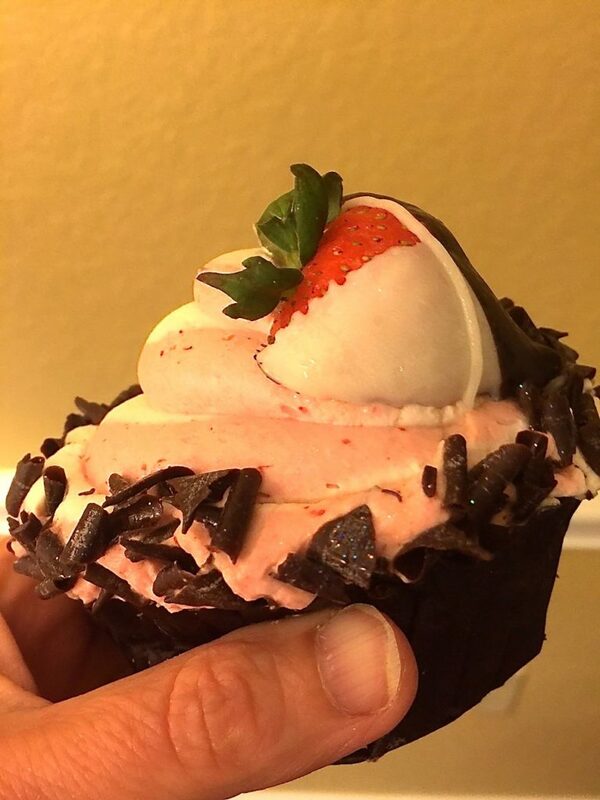 This Strawberries n Cream Chocolate Cupcake that I came up with turned out amazing and takes me right back to Orlando!! The cupcake at Disney was jumbo sized so I started off with a Jumbo Muffin Pan . You’ve got to get one of these if you don’t have one yet! Each jumbo cupcake is basically the size of two regular size cupcakes, so it is double the fun! I started with a light chocolate cupcake batter. Light, and not dark because I didn’t want the strawberry flavor of the frosting to be overpowered by the chocolate of the cupcake. 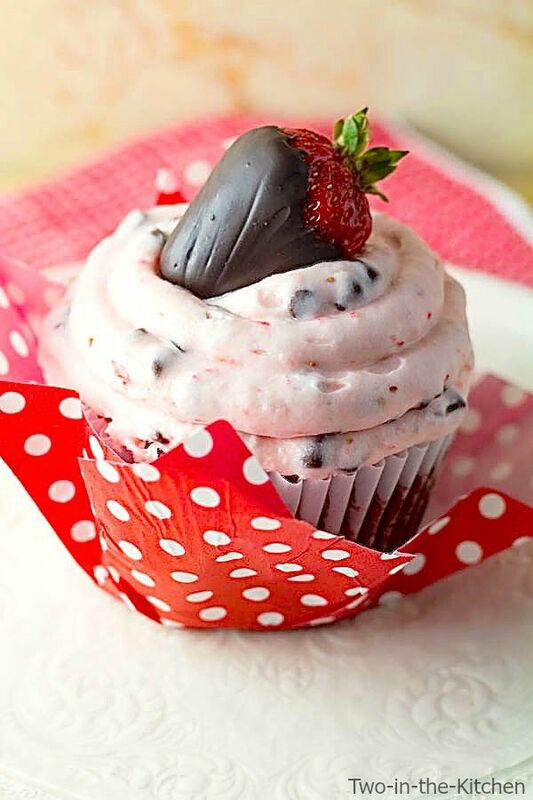 I then piped an irresistible strawberry and chocolate chip cream cheese frosting all over the top and crowned the whole thing with a chocolate covered strawberry. 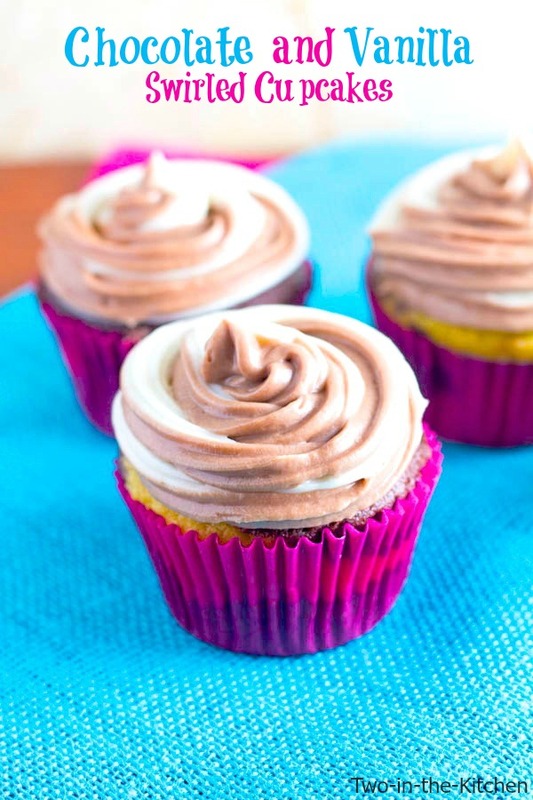 The result is a pretty cupcake that everyone will want to sink their teeth into! Hey, even if you can’t go to Disney World right this second, you can still enjoy the yummy treats that they have to offer. 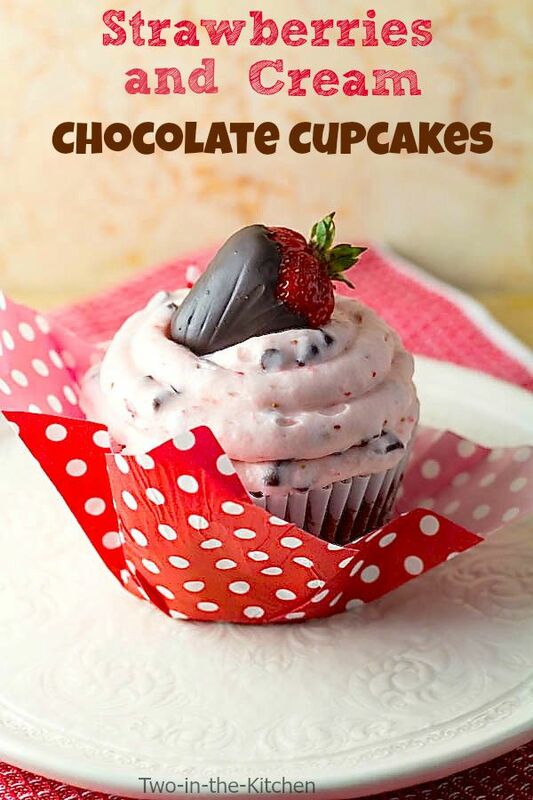 I’ve got you covered with this sensational Strawberries and Cream Chocolate Cupcake! 6-12 strawberries, depending on the size cupcakes you are making. Pre heat oven to 350*. 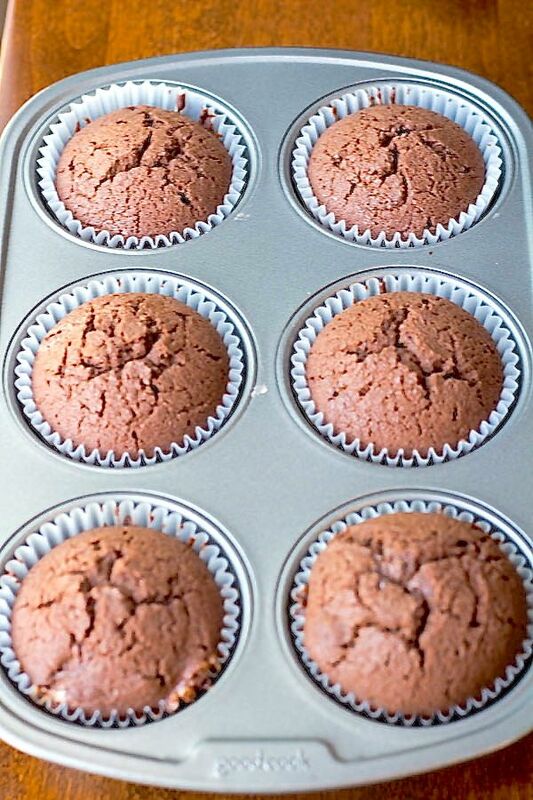 Line 6 jumbo muffin tins with baking cups or 12 regular sized muffin tins would also work well. Beat butter and sugar together in a large mixing bowl until well combined. Add eggs, one at a time, beating well after each is added. Beat in vanilla. Combine flour, cocoa, baking powder, and salt in a medium bowl. Add the flour mixture gradually to the butter mixture, mixing until combined. Spoon batter evenly into the 6 jumbo muffin tins or 12 regular muffin tins. Bake for 18-22 minutes, or until a toothpick inserted comes out clean. Do not over bake. Cool completely on a wire rack before frosting. Cream together the butter and cream cheese in a large mixing bowl. Add strawberries and beat until combined. Add the powdered sugar 1 cup at a time until desired consistency is reached. Stir in the mini chocolate chips. these cupcakes look delicious Renee! I love the strawberry-chocolate combo! I can’t believe my kids go back on the 20th — summer goes way too fast, right? Thanks Marcie! I know, I’m not ready to say goodbye to summer just yet!! That chocolate covered strawberry on top just looks like perfection! I just can’t believe summer is over (almost ) :)! These cupcakes are gorgeous! Love them! Pinned! My son starts school in September for the first time and I can’t believe summer is almost over too. 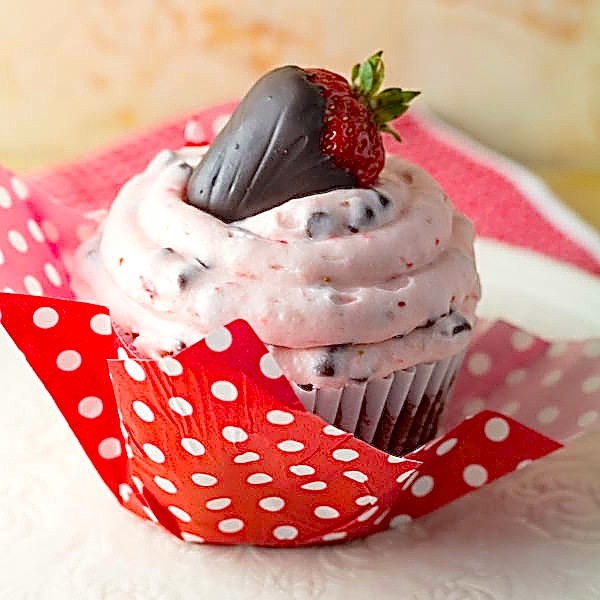 I’m still not ready to let go of strawberries yet so these cupcakes are perfect! Kids by us already went back to school – which is crazy to me! Where I grew up we always started right after labor day!! And these cupcakes look absolutely fantastic! Love the strawberry / chocolate combo! such pretty cupcakes Renee, I’ll have a dozen please! What gorgeous looking cupcakes! They almost look like a present they are packaged so beautifully. Great flavor combination too, Renee!